The Breville VTT476 Impressions 4 Slice Toaster is one of the best selling toasters that is currently available on the UK marketplace. Buyers have bought this toaster in its thousands. Overall they rate it very highly as a 4.6 out of 5 star product, which we will discuss in more detail later. Please note if purchasing online, then each colour has a different model number as shown below. The price may also vary slightly, with the colour options being around £1-2 more expensive. 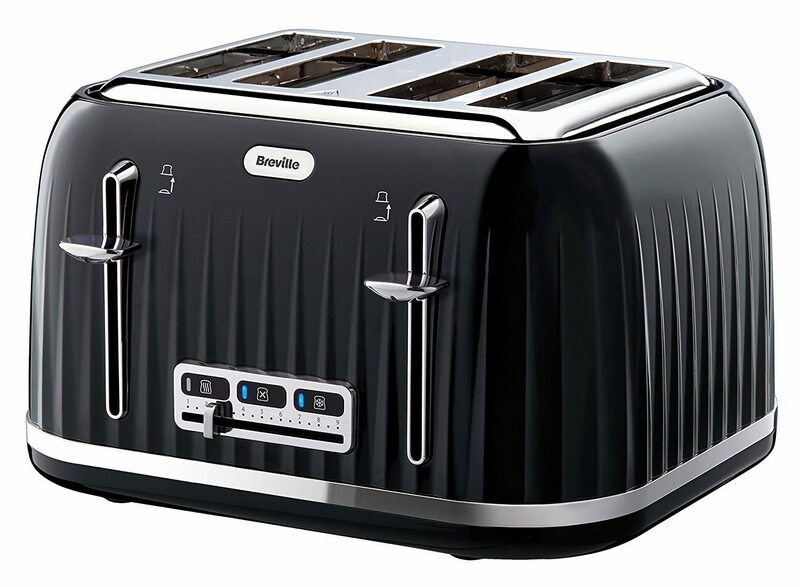 How do Buyers Rate the Breville VTT476 Toaster? Breville became very well known in the UK in the 1980s when they invented the sandwich toaster. Breville now make kettles, toasters and Irons, as well as a range of food preparation products such as blenders, food processors, juicers and many others. Breville is a part of Jarden Consumer Solutions (Europe) Limited. It is always important to read reviews before buying anything. This toaster is something you will use every day. That makes it even more important, so as you can know you are buying the right one for your needs. We have read a lot of reviews about this Breville toaster, and then summarised those below. Hopefully you will find that useful​. The first illustration shows the percentage of stars, given to the product, by actual real life buyers. They scored the product out of a maximum of 5 stars. You can see from the above figures that 3 out of 4 of buyers rate the Inspirations toaster as a 5 star choice. That is of course an excellent rating, and should assure you these are very high quality. 91% rate it as a 4 star or higher, and only 4% rated it as a 1 star product. Below we have captured what buyers actually said. This includes all buyers as we like to keep our reviews balanced. Even though only 13 out of 300+ buyers rated these saucepans as a 1 star product, we always like to find out why. Clearly a few people had problems with this toaster and hence the 1 star reviews. Overall though it is worth bearing in mind that 3 out of 4 people, rated it as a 5 star. We do like to include the poor reviews, but always make sure to balance these out. You can see from the image above, that this is a stylish toaster. More importantly though it toasts 4 slices or less, and does that very quickly. The levers make it easy to adjust, and the illuminated controls make it easy to use, and easy to see. Just below I have included a video review of this popular family sized toaster. The 4.6 out of 5 star buyer rating is very well justified. This is a good toaster and ideal for larger families. The reviews generally speaking are very high with 3 out of 4 buyers, awarding this the full 5 star treatment. The only thing that puts us off highly recommending a product, is if we find a number of legitimate poor ratings. There were only a few poor ratings, but when compared to the large amount of high reviews, we still rate this Breville toaster very highly. If this is not the 4 slice toaster for you, then check out our top 5 list of 4 slice toasters by clicking here. This one is as good as any other on the market, and we think the lower price does represent great value for money.